Activation marks Netflix becoming available on Sky Q.
Sky and Netflix have created an experience around some of their most popular shows to mark the launch of the streaming platform appearing on Sky Q. In the "House of Sky Q", visitors can take a seat in the Mariposa Saloon from Westworld or "feel the cold beyond the wall" from Game of Thrones. In the Netflix areas, visitors get a chance to sip tea in Buckingham Palace à la The Crown or help search for Will from Stranger Things. The brands are taking over The Vinyl Factory in Soho for three days from 16 November. The experience is being delivered by RPM. 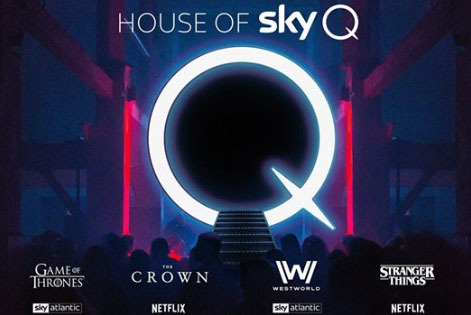 Its managing director, Dom Robertson, said: "As the new Sky and Netflix partnership promises the very best in TV content, we are delighted to be bringing the very best experience for the viewers to come along and be inside their favourite shows at the House of Sky Q this November."